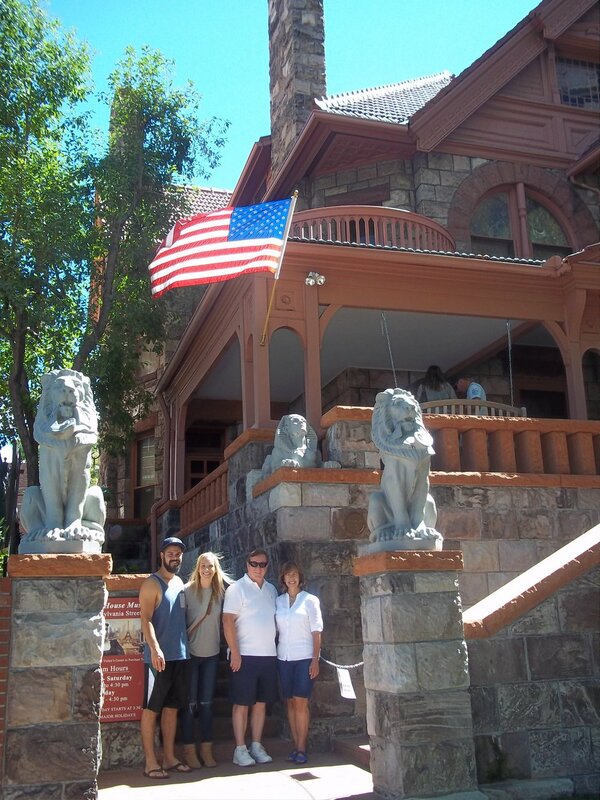 Two weeks ago, I had the opportunity to visit Margaret Brown’s home in Denver and learn more about this fascinating Titanic survivor and her family. 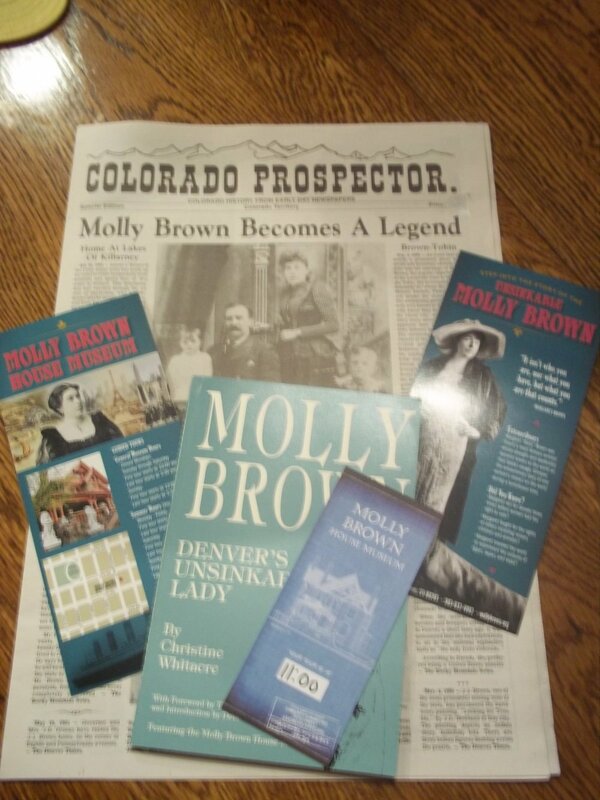 Given the name Unsinkable Molly Brown in a stage play about her life, Margaret Brown did much more than help row her lifeboat following Titanic’s collision with the iceberg. 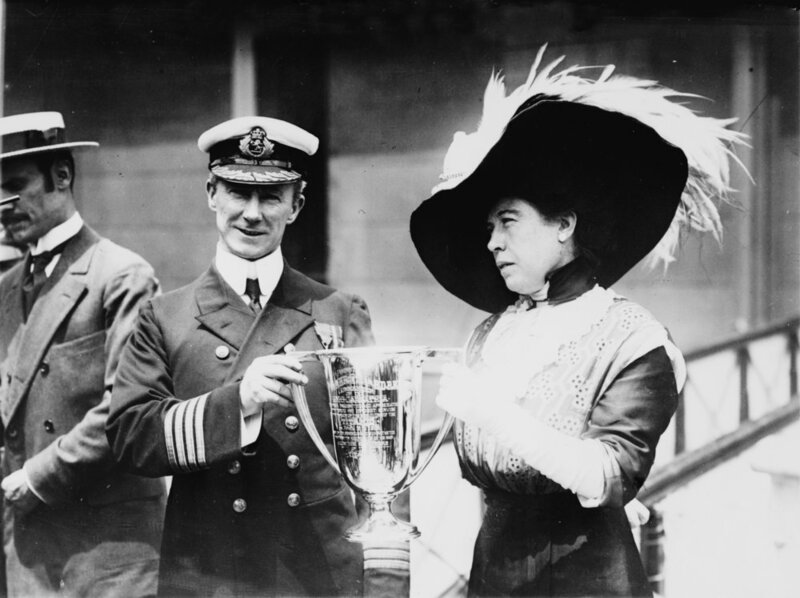 She raised funds to help survivors, ensured Captain Rostron of the Carpathia received recognition for the rescue efforts, and erected memorials in New York City and Washington D.C. to honor the victims. Born in 1867, Margaret (Maggie) Ann Tobin hopped a train at the age of 18 and left her family in Hannibal, Missouri to share a cabin with her brother, a miner, in Leadville, Colorado in the hope of finding a husband. She took a job at Leadville’s Daniels and Fisher Mercantile, and met James Joseph (J.J.) Brown at a church picnic. J.J. was a silver miner whose parents had immigrated from Ireland. 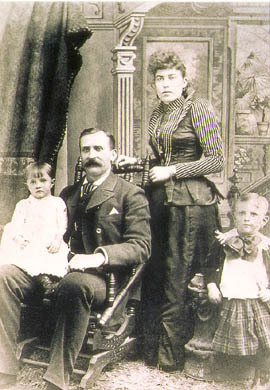 Margaret and J.J. were married in 1886 and soon welcomed a son, Larry, and a daughter, Helen. Margaret later said those were the happiest years of her life. While Margaret became active in the women’s suffrage movement in Colorado, the Leadville silver mines suffered under the Sherman Silver Purchase Act. But J.J. Brown had an idea to extract gold from Leadville’s Little Jonny Mine. His idea worked, and the mine began daily shipments of 135 tons of ore. As J.J. became a successful and well-paid mining executive, the family purchased a home in Denver for $30,000. They also bought a vacation home near the mountains. J.J. and Margaret filled their home with an eclectic mix of fine Victorian furniture, art, books, and treasures from their travels abroad. The home had electricity, indoor plumbing, and even a telephone near the formal parlor. Margaret worked with established organizations dedicated to women’s rights, literacy, and education, or founded them herself. She raised funds to build a local hospital and a cathedral, helped start the first juvenile court in the US, became one of the first women in the US to run for political office, and worked tirelessly for improvements in labor and human rights. J.J.’s health began to suffer, along with the couple’s marriage. With the children in boarding schools, Margaret spent more of her time in Newport, Rhode Island, where she and J.J. had rented a cottage. In 1909, the couple were separated. Margaret continued her work on the important issues that concerned her. She also traveled extensively and learned five languages. The books in the home's library reflect a wide variety of interests. In 1912, Margaret and Helen were traveling with John Jacob Astor and his wife in Cairo, Egypt. Margaret received word that her grandson, Larry Jr., was ill. Helen, a student at the Sorbonne in Paris, decided to remain in Europe, but Margaret chose to return to New York with the Astor’s on the Titanic. Following the collision, Margaret boarded Lifeboat 6. She and other women in the lifeboat helped row and kept the passengers’ spirits up until they were rescued by the Carpathia the next morning. She immediately began raising funds to help the survivors. On my tour of her home, the story was told that Margaret posted a list of the first class passengers and noted the amount of their contributions next to each name. No one wanted to have a blank space next to their name, and by the time the Carpathia reached New York, $10,000 had been pledged. Practically overnight, Margaret became known as one of the heroines of the Titanic. She continued working for women’s rights and other causes, and was instrumental in the rebuilding of war-torn areas in France following World War I. She died in New York in 1932 at age 65, and is buried next to J.J. on Long Island, NY. 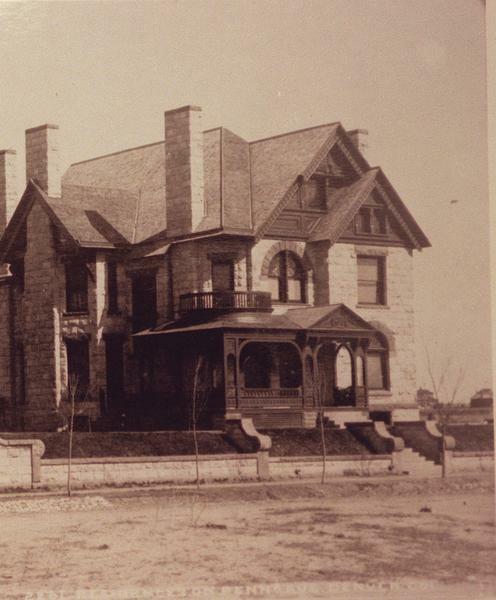 The Brown’s Denver home, once known as the House of Lions, was often rented out while the family traveled. After J.J.’s death, Margaret was forced to turn it into a boarding house during the Depression, and it was sold after her death for $6,000. It became a rooming house for men, and later, a home for wayward girls. It was scheduled for demolition in 1970, but was saved by a group of concerned citizens who formed Historic Denver Inc. and raised funds for its restoration to its former glory. 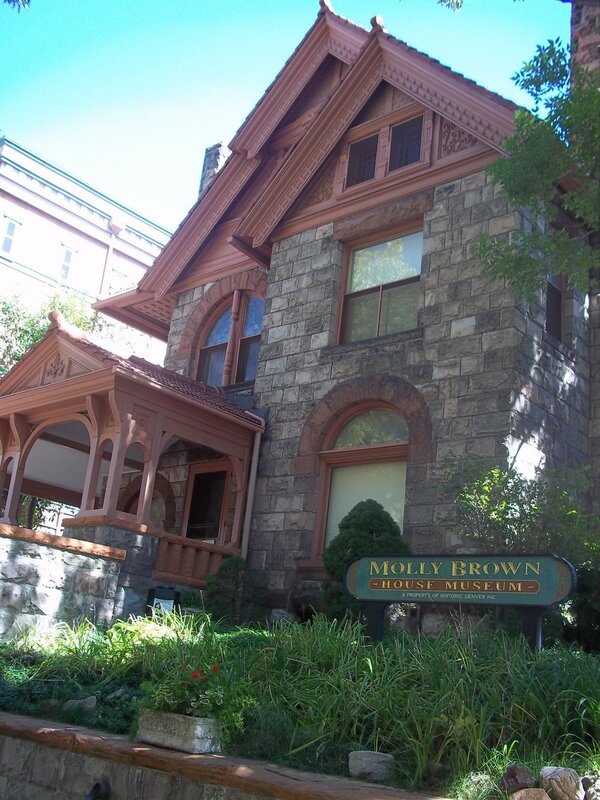 The home is now open daily for tours, and features many of the Brown family belongings, photographs, and mementos. A display of Titanic memorabilia and the story of the tragedy and Margaret's part in it is also included on the tour. Contrary to popular belief, Margaret was highly-regarded among most of the upper class during her time. For further reading, please see Unraveling the Myth by Kristen Iverson. Photo credits: Encyclopedia Titanica, Molly Brown House Museum, Wikipedia.org. Thirteen newlywed couples boarded Titanic—nine in first class, two in second class, and two in steerage. The youngest were teenagers, the oldest in their 40s. Some were already expecting their first child. What did they experience on that fateful night of April 14th, 1912? Did they survive? And what happened to them afterward? Beginning this week, here are their stories. Titanic's most well-known passenger, 48-year-old John Jacob Astor was one of the richest men in the world. He’d divorced his first wife, Ava, just two years before announcing his engagement to Madeleine Force. Rumors spread, especially when newspaper reporters learned Madeleine’s age. At 18, Madeleine was a year younger than the multi-millionaire’s son. Several ministers turned down the generous fee John offered them to officiate. Finally, one agreed to perform the wedding at Astor’s Rhode Island home. Those in attendance at the romantic ceremony claimed the bride and groom were obviously in love. In order to quiet the scandal surrounding them, the newlyweds decided to embark on a long European honeymoon, beginning with a trans-Atlantic cruise aboard the Olympic, Titanic’s older sister. Accompanying them were John’s valet, Madeleine’s maid, and Kitty, their pet Airedale. A nurse for Madeleine, who was three months pregnant, traveled with them as well. On the Olympic, the couple met Margaret Brown, an outspoken advocate for women’s suffrage. She visited the pyramids in Egypt with them, then Italy and France, where she received word that her grandson was ill back home. She booked passage on Titanic and would board at Cherbourg. Madeleine, not wanting to risk having her child far from home, asked John if they could join Margaret on the voyage. The Astor’s were given a superior suite of rooms in Titanic’s first class section. Madeleine loved the ship but couldn’t help feel the cold stares from passengers who knew her husband and his first wife. Margaret Brown encouraged her to ignore the gossip and enjoy herself, and soon the couple became acquainted with other newlywed passengers. When the ship struck the iceberg, John and Madeleine were sent to the boat deck and told to wear their lifebelts. Hoping another ship would come along before boarding the lifeboats became necessary, John led his wife to the gymnasium to wait. But by 1:40 am, Titanic had a severe list. Despite Madeleine’s protests, John helped her board Lifeboat 4 and asked Second Officer Lightoller if he could join her. When his request was denied, he helped Madeleine’s maid and nurse board the boat, then waved goodbye. Madeleine hoped her husband would take another lifeboat. She helped row Lifeboat 4 until the Carpathia came to their rescue the next morning. On board, she asked everyone about her husband until it was finally determined that he had been one of the many men who had gone to their death. Madeleine was inconsolable. John Jacob Astor’s body was recovered and a private funeral held at the family’s Rhode Island estate. His pockets contained $2,500 in cash and a watch that had stopped at 3:20. Madeleine gave birth to a healthy baby boy exactly four months later and named him John Jacob. She remained in mourning a long time for the man she had loved, caring for her baby and only seeing close friends. A pre-nuptial agreement stated that she was entitled to interest on a five-million-dollar trust fund as long as she didn’t remarry. But in 1916, she married a childhood friend, ending her rights to the Astor money. She had two more sons, and died in 1940 in Palm Beach, Florida.